Both versions of audition-and-decide are meant to serve as exams created by a max programmer / administrator of said exams. 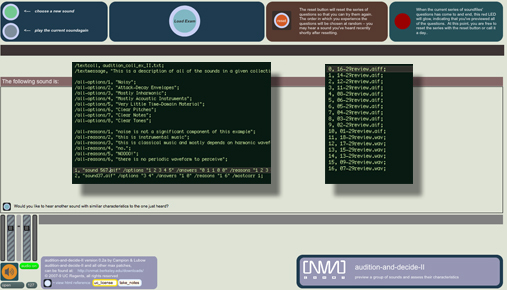 The quiz format differs slightly between versions, and consists of various questions relating to sonic descriptors the user answers. In so doing, they explore the sound collection. Please see the readme.rtf file in the Depot for more details.